Roger was born in Northern Ireland and emigrated to Australia at the age of 11. 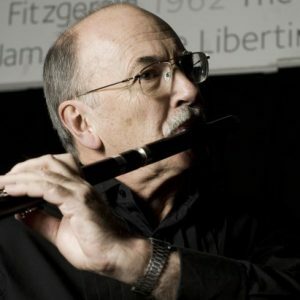 He began his flute studies at 15, and after graduating from the Sydney Conservatoire of Music with first class honours spent two years freelancing in Sydney before joining the West Australian SymphonyOrchestra in 1971. Shortly after returning to Britain, he took up the post of sub-principal flute with the BBC Welsh Symphony Orchestra in 1974, a position he held until 1991. Roger now pursues a varied freelance career, both as a performer and as a teacher. He is principal flute with the National Chamber Orchestra of Wales and teaches at Cardiff University and the Welsh College of Music and Drama. He enjoys musical challenges which are ‘off the beaten track’. He has built his own harpsichord, and is currently engaged in a study of music by an autistic composer. Roger plays a wooden Powell flute made in 1998.